Filet mignon is the king of beef. 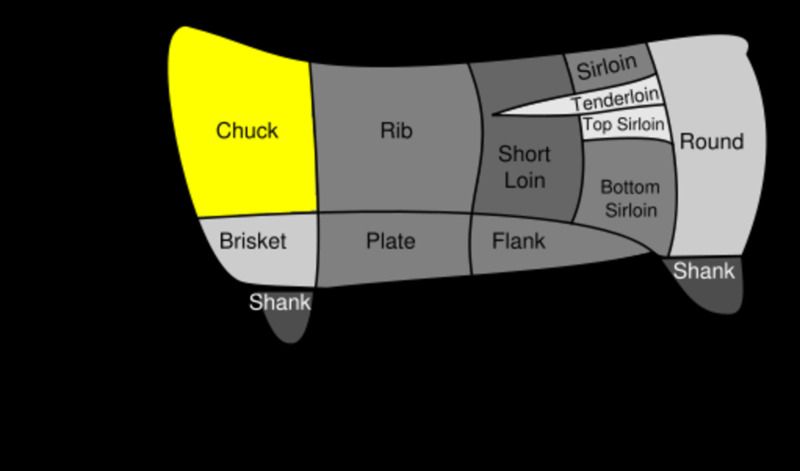 It’s cut from the beef tenderloin, but it may also be in stores cut in steaks and labeled beef tenderloin (Filet mingon and beef tenderloin steaks are the same thing). For more information on how it’s cut and on the merits of grass-fed versus corn-fed filet, see my other article on filet mignon. I know some people like their beef well done, but, in my opinion, filet mignon should be served medium rare at 125 degrees. 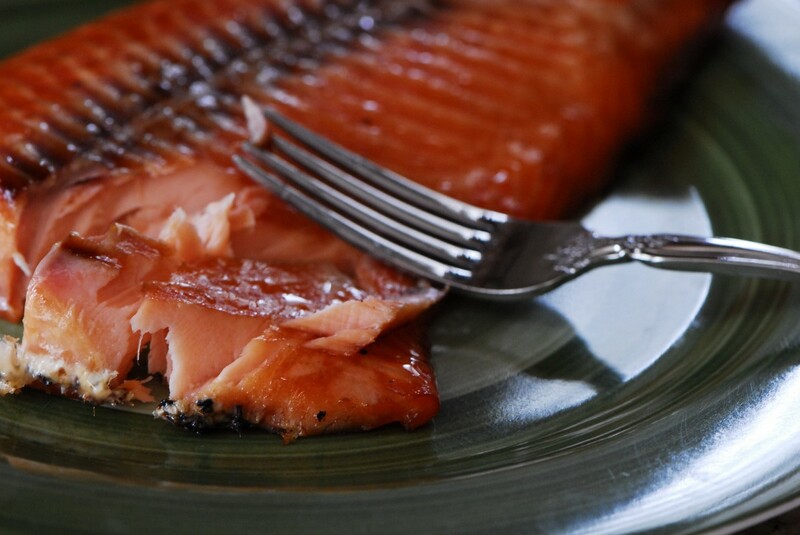 It's best with a very simple presentation that lets its moist, fat-marbled taste stand out. 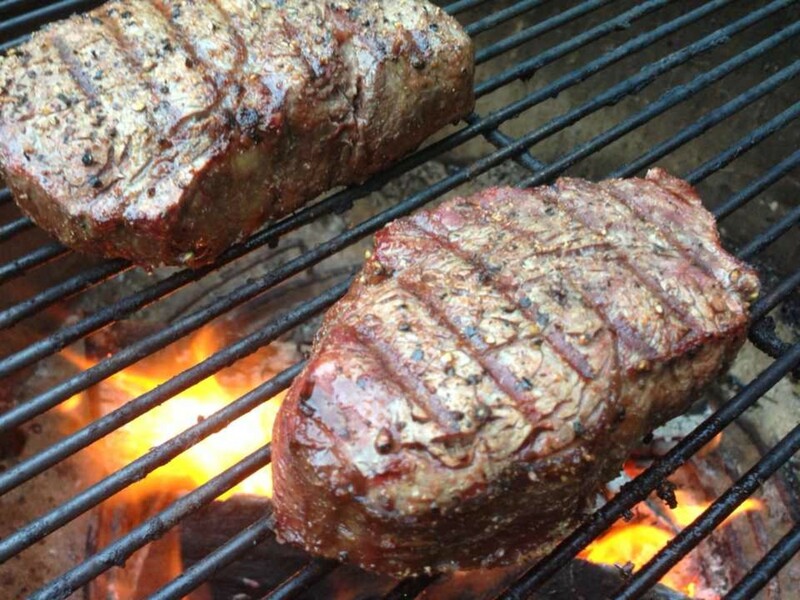 Here is how to grill perfect filet mignon. * Note: Prime filet mignon vs choice cut filet are very similar. If just starting out grilling filet steaks, I recommend using the less expensive option of choice and waiting to do prime once you have the cooking technique mastered. Take the meat out of the refrigerator two hours before grilling. Getting the meat to room temperature will help it cook evenly. 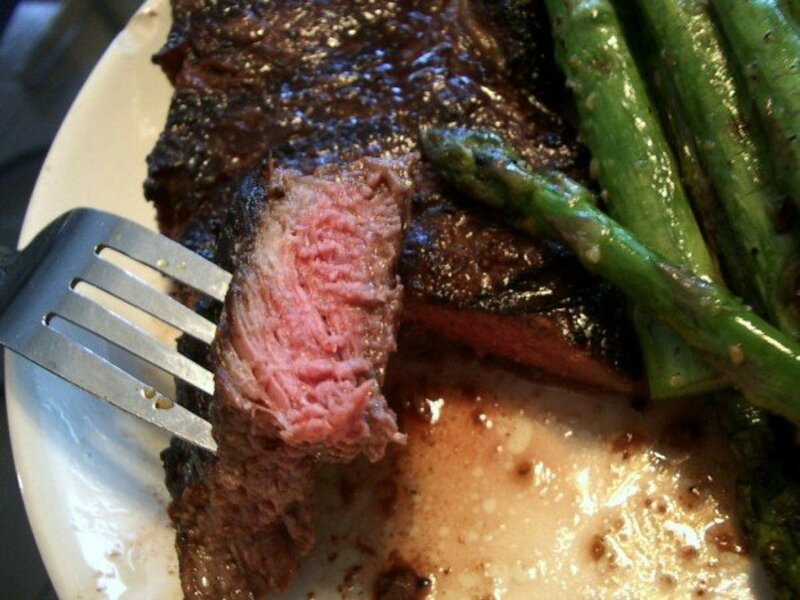 Never put filet mignon directly out of the refrigerator onto the grill because the steak won't cook evenly. Put the filet mignon on a plate, drizzle with olive oil, crack fresh pepper onto it, and then add salt to both sides. I like to pat the seasoning gently into the meat with my hands. Heat the grill to (500 degrees), and scrub it with a wire brush if it's dirty. Once it's clean, spray it with a little oil to keep the filet from sticking to the grill. Filet Mignon Searing. Notice how the flames are extending toward the grill and almost touching the steaks. Filet mignon needs to be grilled (that is, seared) at a high temperature. Using a pair of tongs, place the steak on the grill (it must be hot enough to make it sizzle right off) over high heat and close the lid. I cook it twice on each side, turning the steak three times total. This process creates grill marks on on each side (see below). To cook a 1 ½ inch steak at 500 degrees to medium rare—and like I said, medium rare is the best—each turn on the grill should be no more than two and a half minutes long, for a total grilling time of ten minutes. 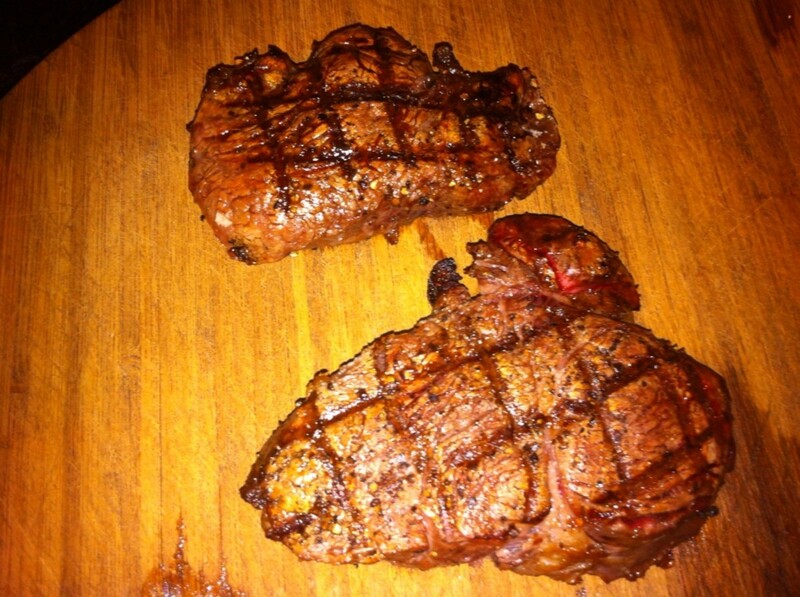 In this example, I'm grilling Argentinian style, over small pieces of aged oak wood. This adds a smoky dimension to the meat. However, these instructions work great with a gas or charcoal grill which is what I typically use to cook filet mignon. Getting perfect crisscrosses on the steak takes a little practice. The hot grate brands the beef with the distinctive lines. Make sure the barbecue grate is fully heated before grilling. Try to grill each side about the same amount of time. When you flip the steaks, turn them 90 degrees, to get a new, intersecting set of lines. Beginners run into problems because they get to the end of the grilling session and realize the meat isn't done. So they continue to grill and to avoid one side getting too done, they continue to flip the meat. 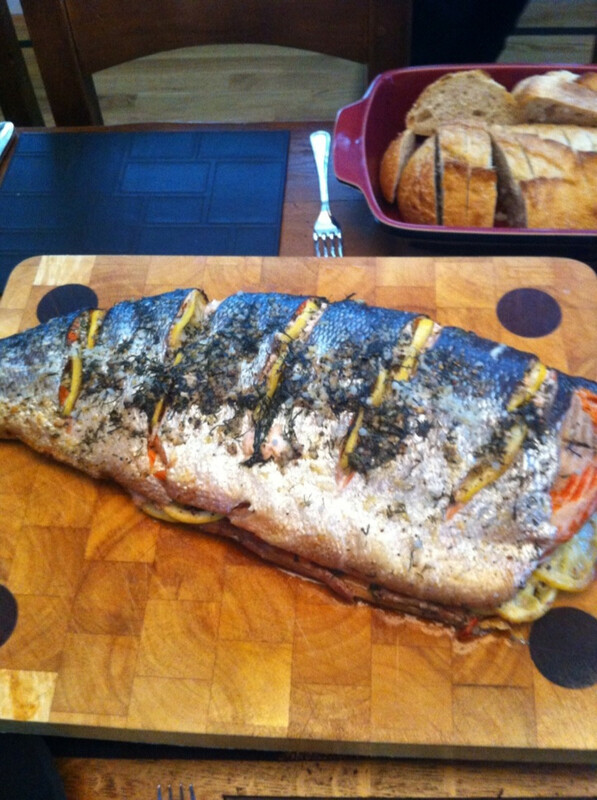 The meat will likely taste delicious, but it won't have the perfect presentation. The best way to get perfect sear marks is to know how hot your grill gets. It may require the burners set to medium-high heat or high heat to reach 500 degrees. If it's a lot hotter than 500 degrees it will cook faster. Times on a 500-degree grill. The internal temperature will rise as the steak rests. To be sure of the temperature, use an instant-read thermometer (I use a Thermapen that's used in labs). At the very end of the last two-and-a-half minute grilling period, insert the thermometer from the side of the steak and get a temperature reading. Even though USDA recommends a higher temperature for a medium-rare steak, I find pulling my steak off the grill at 120 to 125 degrees results in a perfect medium rare steak, just the way I like it—because after you pull it, it continues to cook, and the temperature continues to rise. 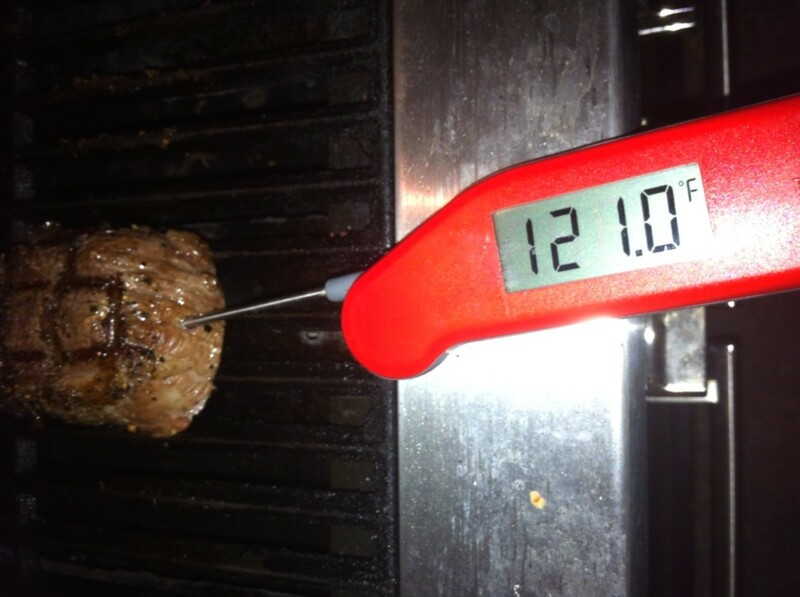 Many purists think it's sacrilegious to pierce a steak with a thermometer, for fear of losing all the succulent juices. While an insignificant dribble of juice will escape when the meat is pricked, using an accurate thermometer is well worth it, if, as a beginning griller, you want to know when to pull off your steak. Once you know your grill and its hot spots very well and have a good idea how long steaks take to grill, then you can gauge the internal temperature with a cooking timer. Until then, use an instant-read thermometer. Once the meat is pulled from the grill, let it rest for ten minutes before serving. While the meat rests, the internal temperature typically rises an additional ten degrees. Lots of people overcook their meat because they think that pulling it off at 130 or 140 degrees will result in a medium rare steak. It won't. It will result in a well-done little brick. If you want medium rare filet, pull it at 120 to 125 degrees. 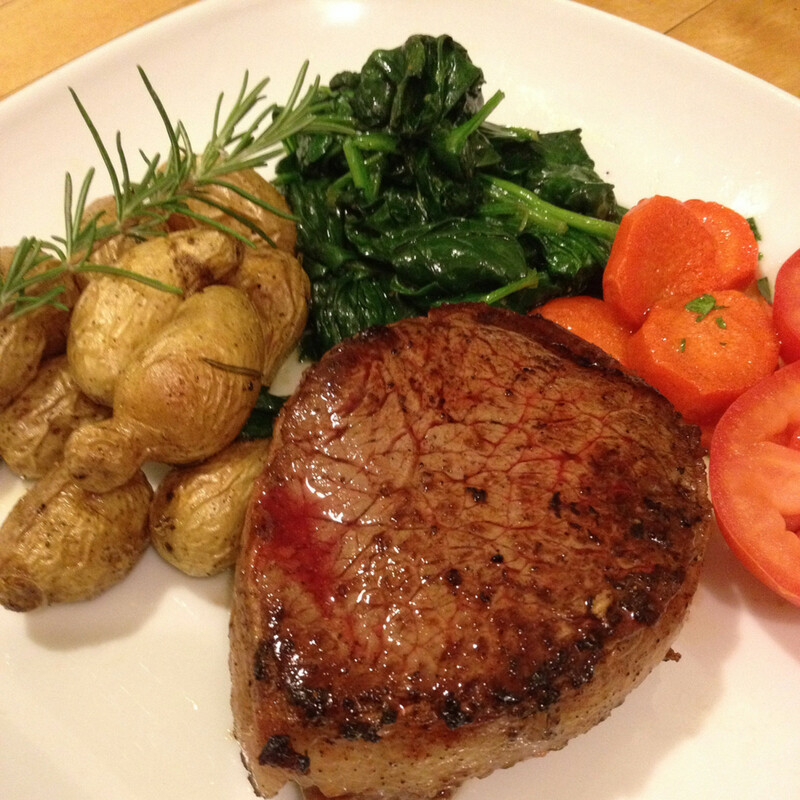 Perfectly cooked filet mignon should be pink from edge to edge, moist and delicious. Remember the keys to perfectly grilled filet mignon: start with room-temperature steak, heat the grill well, and use a meat thermometer. Now, it's time to enjoy your dinner. I recommend pairing filet mignon with a full-bodied red wine. Cabernet Sauvignon is my favorite choice. These classic variations will come out delicious on the grill if you follow the instructions above. Season the steak, wrap the bacon around its circumference, and pin it together with a toothpick. Small fillets work best for this so the bacon wraps completely around the steak. Season the steak with salt and pepper, and make a small slit in the side of the fillet about two inches wide that reaches past the center point of the steak. Stuff with about a tablespoon of blue cheese. Pin the edges of the steak back together with a toothpick. Season the steaks with Kosher or coarse salt and pepper to taste. During the last two minutes of grilling (gas grilling or charcoal), place a quarter inch pad of butter on top o f the steak and let it melt. 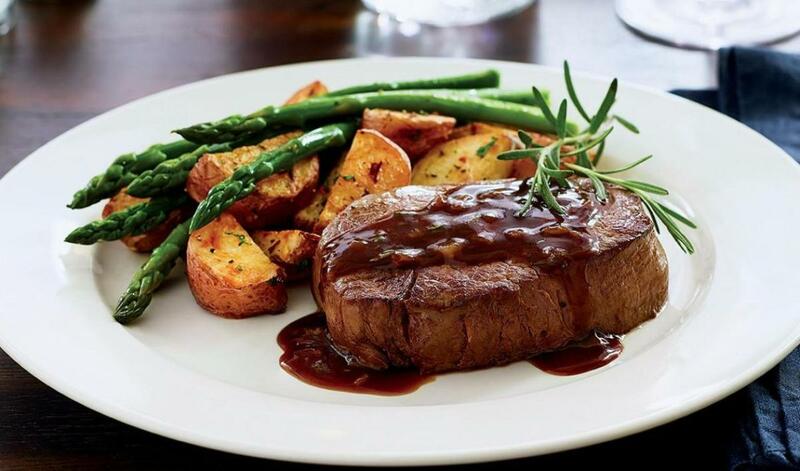 Prime filet is extra rich and the added butter sends the richness through the roof! What's the best preparation for grilled Filet Mignon? 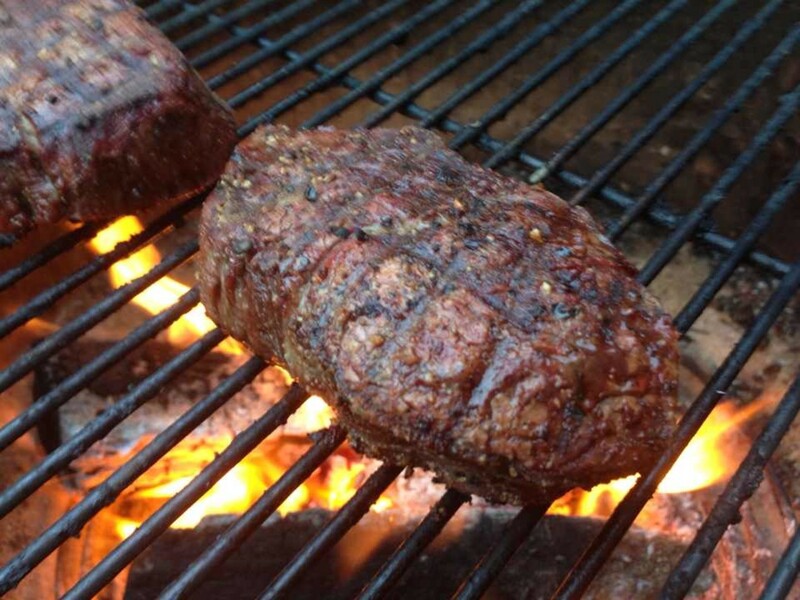 How long should a whole beef tenderloin cook on a grill at a low heat to reach a 120-125 internal temp? Since the thickness of tenderloins vary, it’s best to use an internal meat thermometer instead of a clock to get a perfect internal temperature. That said, grilling at a low heat, with the tenderloin positioned indirectly, it takes about 45 minutes to a bit over an hour. This method of grilling is my current favorite, with outstanding results. We are going to the mountains to camp where a Weber grill is provided. 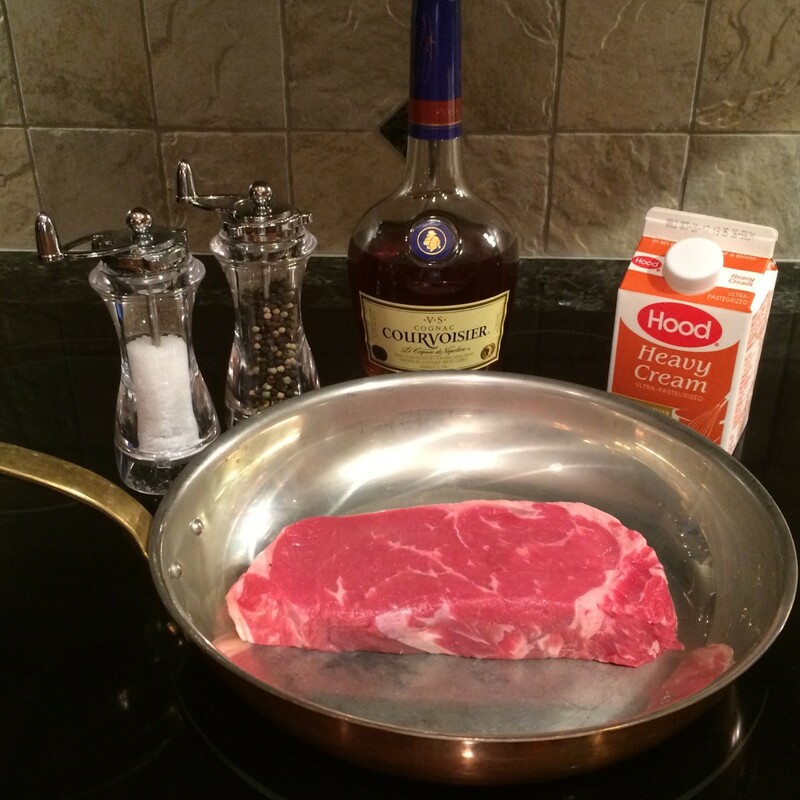 How do we know when its time to throw the steaks on? I have some hickory chips as well. If you have a chimney starter, use that to light the coals. Once they are white, spread them in one bank on the side. This sets the grill up for indirect grilling. Place the steaks on the opposite side as the charcoals and cook until medium rare. As for the chips, steaks cook so quickly, they don’t add much flavor, so I’d hold off on them, but if you want to soak them in a little water and sprinkle on the coals, they will put out a great smelling smoke for all the critters near the campsite. How do I barbecue a 10 lb filet mignon? That’s a beef tenderloin. The very best way is to use string and tie it up and curl the tail in to keep the thickness even. Season the meat with kosher salt and pepper to taste. Set the barbecue up to the lowest temperature possible (250 degrees) and grill the meat low and slow. Use an internal meat thermometer and pull it at 120 degrees. When the meat is off the grill, turn the grill up to as hot as it goes and then put the meat back on and grill it for 45 seconds a side to put a little crust on it. BBQ aficionados call this the reverse sear and it produces unbelievable results. 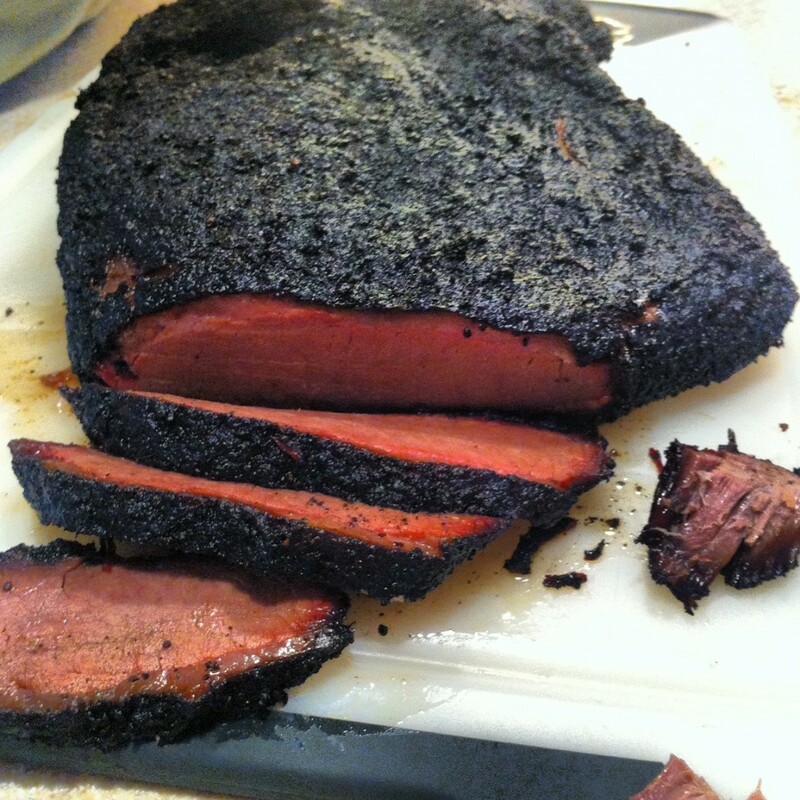 How long should a 10 lb loaf of tenderloin cook on a 5ft smoker with a fire box? It's a question of how hot the smoker is. If you go low and slow at 250 degrees or lower it can take an well over an hour and most likely two hours. The best way is to use a meat thermometer. If it's at 125 degrees, pull it and let it rest. Tenderloin is great at room temperature. If you tent it with tinfoil, the temp will continue to rise to a medium (140 - 150), but it will be warmer when you serve it. With only an hour till it's time to eat, you are in great shape. It will be delicious. Help anyone. My beef tenderloin is at 125 and I have an hour to go before I serve it. Do I take it off and put it back on 20 minutes before giving it a rest or what? Grilled 1 1/2 inch thick filets exactly as directed on this site and had one of the best steaks ever--they came out perfectly medium- rare. Very great recipe guide with an elaborative instruction and for cooking the recipe in a perfect manner. The images are simply appealing and attractive. I appreciate your skills in presenting it, even though I am a vegetarian and do not eat non-veg. I think if you want to get into the etymology of the word, that at one time, barbecue was considered a low and slow type of smoking of meats. Over a glass of wine or two, I've heard long histories and passionate pleas to describe bbq vs grilling. I try to keep it simple. If it cooks with smoke it's barbecue. It can also be grilling if the heat is direct. Some people insist that grilling is open lid and direct heat. I think you can grill with the lid closed. For most people, they just want something tasty to eat. I don't mean to quibble, but don't you mean "How to Grill Perfect Medium Rare Filet Mignon". Barbecue would imply an hours long low heat smoky process. Ha, I'd sacrifice the criss cross for a more succulent piece of meat. My buddy has an infrared grill that probably gets up to 1000 degrees. On my Kamado grill with oak wood as the fuel, I can get the grill temperature near 1000 degrees as well, although I suspect that this intense of heat isn't great for my grill. cast iron is useful because it is one of the best materials for conducting heat evenly. A good cast iron skillet will get much hotter than your barbecue and sear the steak faster for more moisture retention. However, get your self an infrared grill and everything changes! Not the pretend stuff like charbroil or the newer TECs but an original TEC or a Solaire and the grilling surface is over 1000 degrees in minutes. I have personally grilled T-bone steaks med-well on a ceramic topped infrared burner and the plate filled with moisture when I cut the filet and the strip off the bone because the intense heat sears so fast no moisture can escape. For steaks, fish and burgers an infrared grill changes everything -- the flavor is amazing.... but there are no criss-cross designs. Pan fried steak is underestimated. On days that it's too wet to bbq, I usually go to my cast iron pan and season with garlic, parsley, and olive oil. Great hub, especially the use of a thermometer. In a pinch, a cast iron skillet can turn out an amazing filet mignon, as well. Hi Paul, This recipe for fillet mignon looks absolutely delightful! Thank you for sharing this useful and informative recipe Hub. The grill is a kenmore. I got it used, converted it to natural gas and put new burners in it. It's pretty nice. What do you use tinfoil for - preventing flareups? Good useful info in this hub Paul. Voted up & useful. From the pics, it looks like you're using a CharBroil series gas grill. But what's up with not using any aluminum foil on the grill? We have one and get to use it quite a bit during the Spring, Summer and early Fall. We love to grill steaks, turkey burgers, chicken, seafood and veggies. I have a video, but waiting till vids can be added to hubs. Paul, I feel that this Hub would benefit a lot with a video or two! Very detailed. Looks so tasty! Love meat cooked on the bbq !Tastes really good. Enjoyed your hub. Thanks for pointing out typo in the comments. Really appreciate it. I'll fix it up. Best. I agree that grilling meat of this quality should be very lightly seasoned. There are just some dishes where the entrée just needs to be left alone to some degree. Good pairing with Cabernet. Voted up and useful. Great hub, and the pictures are just making my mouth water. Interesting info on the temperatures - I've never done that with steaks. 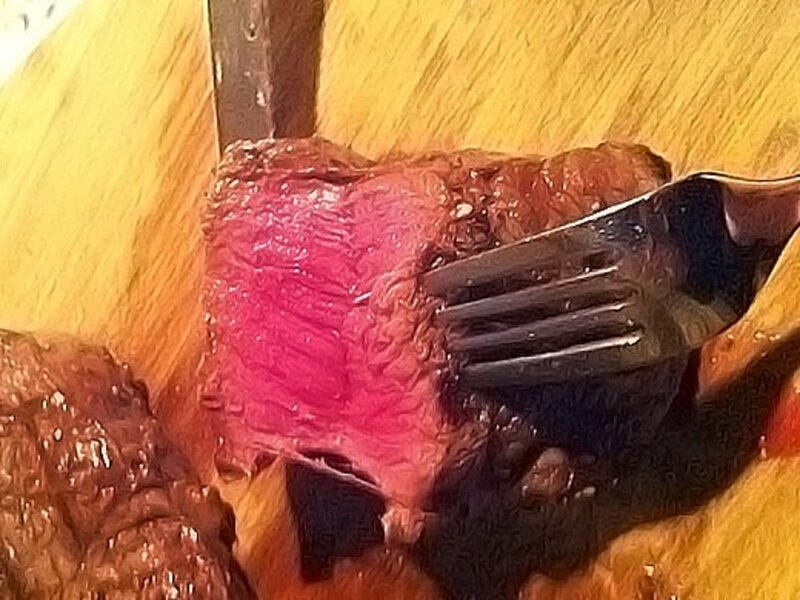 I've always just cooked on "feel", and generally I'm right, but your last picture looks like a perfect steak to me. Slight typo, if you care: "To avoid one side getting two done" should be "too". Sorry if it's cheeky to point out to the CEO.